June is a very busy month for us. Both Mark and I are June babies, we’ve got a vacation scheduled and two of our good friends are due at the end of the month! I promised myself last month that I’d get ahead and put together some freezer meals to break out on crazy nights. And, I failed. I’m really going to try to have at least one freezer-friendly meal on our weekly menu for the next couple weeks so when we get back from vacation I’m not totally swamped with cooking. This was last week’s meal and it turned out beautifully – although, it’s really hard to go wrong with a pizza/pasta combo! Pepperoni and olives are my favorite, so I didn’t bother to play with other ingredients here but now I’m wondering how ham and pineapple would be. 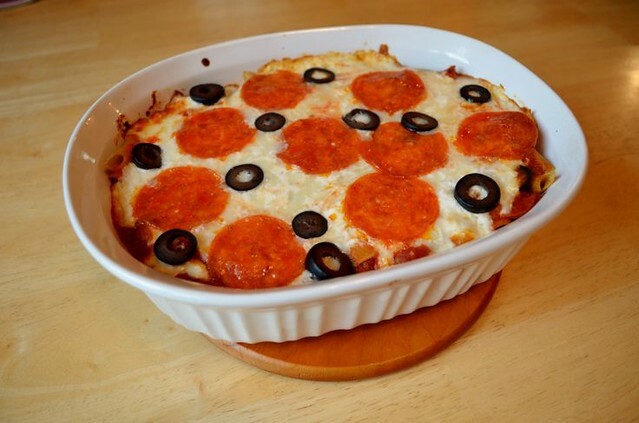 I love Hawaiian pizza – do you think it would work in casserole form?! Cook the pasta as directed on package, stopping a minute or two before fully done. Preheat the oven to 350F degrees. In a large skillet, cook the sausage over medium heat until no longer pink. Add the sauce, 3/4 of the olives and 3/4 of the pepperoni to the pan and stir to combine. Set aside. In a medium bowl, mix together the ricotta, mozzarella and parmesan. Set aside. Spray a large baking dish with non-stick spray and then place half of the pasta in the bottom. Top with half of the sauce and then half of the cheese mixture. Repeat each layer, and then arrange the remaining olives and pepperoni on the top. Cover with foil and bake for 20-30 minutes, until bubbly. Remove the foil and bake an additional 10 minute, until the cheese has melted.